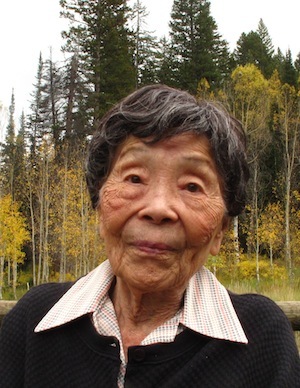 Midvale, Utah-Ida Hiraga Watanabe, died peacefully at home on January 9, 2014 from causes incident to age. Born April 10, 1918 near Pocatello, Idaho to Tsunenori and Ei Hiraga. Educated in Japan at Aichi Kenritsu Dai Ni Koto Jogakko; she worked for Mitsubishi and enjoyed hiking. Ida married Hikomune Watanabe June 18, 1940 in Nagoya, Japan. He preceded her in death in November 1993. Ida, Hikomune, and son Fumihiko were wrongfully incarcerated at Manzanar and Tule Lake Internment Camps for four years. After WWII, they resided for a short time in Lehi, Utah. They subsequently settled in Bingham Canyon, Utah, where two sons were born, and operated a boarding house which catered to Kennecott Copper employees. The family moved to Midvale, Utah in 1961, which has been her permanent home. She worked for University of Utah Food Services and did housekeeping for several prominent families. She enjoyed cooking-especially Japanese food, sewing, knitting, crocheting, gardening, but most of all reading, and loved the Utah mountains. Survived by son, Fumihiko and wife Jane of Salt Lake City and their children, Aaron of San Diego, California, and Jonathan of La Jolla, California; son, Dan and wife Julie of Tucson, Arizona and their children, Lynne of Lansing, Michigan, Jill & husband Vincent of Midvale, and Dean & wife Taylor of Phoenix, Arizona; son Paul and wife Gloria of Boston, Massachusetts and their children, Benjamin & wife Natalie & daughter Kaya of Watertown, Massachusetts, and Joanna of Pearland, Texas. You’re invited to share memories at www.wasatchlawn.com.